Yarn categories are very diverse. When a yarn is listed as a Medium Weight Yarn (Worsted Weight) it does not necessarily mean it will produce the same crocheted result as another Yarn in the same category. Both yarns can even have the same wraps per inch (wpi) and still crochet differently due to the density and elasticity of the yarn. I designed this Half Double Crochet Cotton Hat Pattern to be used with Cotton yarns – which have less stretch and elasticity than acrylic or natural fiber yarns. Please continue to the full written pattern below if you are looking for a free pattern to use with your medium weight cotton yarn. Before writing this pattern for use with cotton yarns, I designed the Free Crochet Pattern – Half Double Crochet Hat Pattern using a soft worsted weight (medium weight) yarn with wraps per inch of 10. The gauge for the yarn, using a 5.50 mm hook is: 14 stitches in 4 inches; 12 rows in 4 inches. The gauge for the cotton yarn though is different which is why I designed a hat pattern specifically to use with kitchen weight cotton yarn.. This pattern is designed to use with Bernat Handicrafter Cotton. This is a worsted weight (medium weight) yarn and it gives us 10 wraps per inch BUT the gauge for the yarn, using a 5.50 mm hook is: 12 stitches in 4 inches; 10 rows in 4 inches. This is a basic crochet hat pattern – this design uses worsted weight (medium weight) yarn – with wraps per inch of 10 (10 wpi). Similar weight yarn can be substituted (like Lily Sugar n’ Creme). Please check your gauge as it is easy to allow your hdc stitches to become more relaxed as you crochet the repeat steps (rounds). This hat is crocheted in continuous rounds/spirals – you do not need to slip stitch to join or chain-1. You can use a stitch marker (safety pin, bobby pin, bit of scrap yarn, twist tie, etc. ) to mark the first (or last) stitch of the round and move the stitch marker up each round as you progress, to mark your place. There is no seam in this hat – it is neat and tidy. If you prefer using the slip stitch to join and chain-1 (or 2) and working in regular rounds – you can – just try to keep those slip stitches small. This will add a seam to the hat (from the slip stitch and chain stitches) and make the hat a little bit larger, but it will still work. Yarn over the hook, insert your hook into the specified stitch, yarn over and pull up one loop. You have 3 loops on your hook. Yarn over and draw the yarn through all three loops on the hook to complete the stitch. Double Magic Ring – I have included this video at the end of the post for you 🙂 This is the MOST secure way to start our hats. Invisible Join – I have included the video at the end of the post. When you click play it starts right at the spot where I demonstrate how to do the invisible join. It takes less than 1 minute to show you how to do this and it is the BEST way to finish off your hats. I have tested the Preemie, Newborn, 0-3 months and Adult Medium sized hats in this pattern. This video will show you how to do the invisible join method. It begins right at the spot in the video where I demonstrate the technique and takes less than one minute to watch. This is the video for the Double Magic Ring. This is by far the best way to begin any project you are working in the round. Rhonda, thanks so much for this comprehensive pattern. I am using it to make what I call hospice hats. These are donated for those individuals whose internal thermometer is out of whack and/or they suffer from the AC. I read all the other posts and do not think the versatility of this pattern has been addressed. The half double crochet stitch can be worked in the front two loops at the top of the prior round as shown in your pics, it can be worked in the back two loops of the stitch in the prior round to create a spiral ridge on the outside of the hat, or it can be worked in the back loop only to create a spiral chain on the outside of the hat. I just made a chemo hat by using your pattern, using the back two loops so I had a spiral ridge and then slip stitching eyelash yarn to each stitch of the spiral ridge, starting from the crown and following the ridge. Turned out beautifully! The ONLY change I make when using your pattern is in transitioning from the last row of hdc to the finishing slip stitch row, I add one single crochet to decrease the row height. I even change colors but make sure all color changes are in a row down the length of the hat so they can be worn in the back. Again, thank you! Hello I’m new to crocheting. Do you slip stich to complete the magic circle and then work Continually around ? The instruction abbreviations mention slip stich but i only see it in the edging at the end. This means work 2 hdc in the first stitch, work 1 hdc in each of the next 7 stitches. 2x means to do this twice. Then work 1 hdc in each remaining stitch around. This round we are increasing by 2 stitches. so it would be 2 hdc in stitch 1, 1 hdc, 1 hdc, 1 hdc, 1 hdc, 1 hdc, 1 hdc, 1 hdc. Then 2 hdc in the next one. Then 1 hdc in each for the rest of the round. The important part on the round is you need to add 2 extra stitches and space them a bit apart so the hat shape doesn’t have a ‘bump’ or spot that all the extra stitches are worked into (sometimes it leaves a small hole because we are squeezing 2 into 1 stitch). How many skeins of say, sugar and cream yarn do I need for the adult medium and large caps? I have some of that at home but may need to buy other colors to have enough to make a cap. Either skein or yardage would help me figure what I would need. Didn’t see amounts listed. I am hoping to make several to donate by April. Had my own bout of cancer and robotic surgery last year, that resulted in exactly three radiation treatments so never lost hair. But still have to visit cancer doc every four months til August then go six months until five years have passed and see others who have lost hair. They are really thrilled to get cap donations so thought making the caps was something I could do for someone else. Did make a couple of soft bulky yarn but was looking for the Sugar and Cream cotton yarn as believe it would be more comfortable in the warmer months. Just need to know how much to buy for each cap. Turned out great. It was fast and easy. Hi , do you have video tutorials for chemo hats pattern. Sorry if its a big ask. Thanks. For the newborn hat how many do you single chain for the adjustable loop? Sorry I am new to crocheting but it seems I should have to chain first in order to make the loop. Hi Carol 🙂 Here is the information you need: This hat is crocheted in continuous rounds/spirals – you do not need to slip stitch to join or chain-1. You can use a stitch marker (safety pin, bobby pin, bit of scrap yarn, twist tie, etc. ) to mark the first (or last) stitch of the round and move the stitch marker up each round as you progress, to mark your place. Hi Carol 🙂 Actually there are only 66 stitches in R9. We are only repeating the (2 hdc in 1st st, 1 hdc in each of the next 7 sts) two times. Then we work 1 hdc in each remaining stitch around. I’m happy the hat turned out great! I made the Adult Large size. Its came out great, but I wanted to let you know that there are actually 72 stitches not 66 in the last increasing round (round 9) and each subsequent round. How many to you chain to start the hat? Hi Brian, The pattern fits the head size it is created for if you meet gauge. Guage is specific to maths. So if you have 3 stitches per inch (as per the gauge for this design) and you crochet 63 stitches this means: 63 stitches multiplied by 3 stitches per inch = 21 inches hat size. The hat stretches 2 inches (which is the ‘negative ease’ in design terms) and will fit up to a 23″ head size. If you crochet the slip stitches at 3 stitches per inch too the hat still fits a 23″ head size. 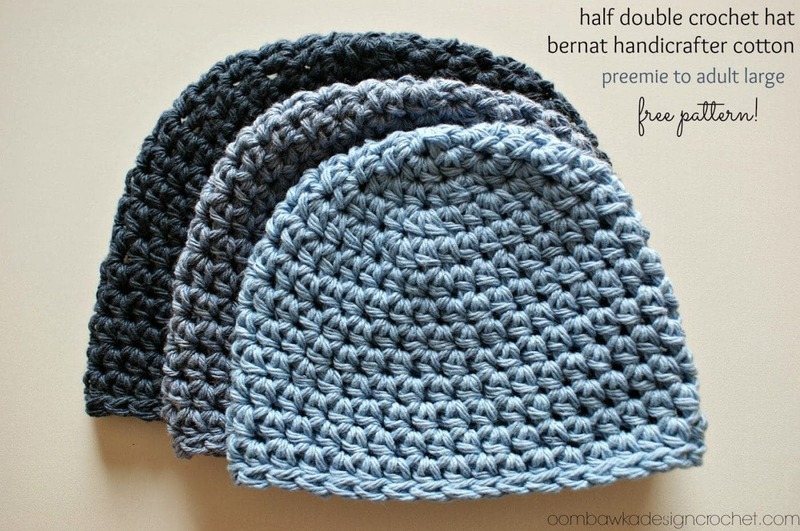 If you crochet tight stitches and make them less than 3 stitches per inch the hat will fit a smaller head size. Math is what the hat is based on so if you are meeting gauge the hat will definitely fit. If you have trouble crocheting the slip stitches to the specified gauge I recommend omitting them completely. If you are relatively new to crocheting they can sometimes be difficult to manage at the relaxed gauge specified. Also if you are new to crocheting I recommend checking your gauge in multiple places on the repeat rounds. There is a tendency for crocheters to either tighten up stitches on repeat rounds or loosen up stitches on repeat rounds. If you start making tighter stitches the rounds of the hat may become smaller and smaller as you progress through the hat. But I do guarantee you if you meet gauge on each round at 3 stitches per inch and you do indeed have the number of stitches indicated in the pattern the hat will be 21 inches in circumference when you are done. Math is pretty specific and it is why I love designing hats. If you reach gauge there is no ‘luck’ to making the hat fit the specified size. Math is a guarantee. Thanks and good luck! Rhondda. Not sure if the picture is viewable, because I am posting from my phone. This is the medium pattern that fits 23″. I used the same yarn, and same hook mentioned in the pattern. This is the first major pattern I’ve done, I’ve only done a couple of coasters and a dishrag up until now. I’m not sure this hat would fit anyone larger than an infant. After I added the slip stitches at the end, it no longer stretches at all. I actually started this pattern over and over again at least 5 times. This does not fill me with much confidence, and is very discouraging. I’m attempting this pattern as a gift for Christmas. There does not yet seem to be any shape, seems to just get wider. I’m on row 13 of 20 for the medium 23 inch) hat. I’m new to this, so maybe I’m just reading the plattern wrong, or doing it incorrectly? I’m sorry I can’t post a picture. Hi 🙂 You could chain 3 and slip stitch to join to form a loop and then work into the loop. Pull the yarn end to tighten the loop closed. Or, you could chain three and work the first Round directly into the 3rd ch from the hook. Either will work. They may cause a small hole at the top but you can easily stitch that closed when you have finished round 2. This will help keep the hat in the same size / shape. Just made this hat for my son. He loves it. I used a different yarn so I ended up having to make many more rows to get the length I needed but it turned out great none the less. Thank you! For the 0-3 months if your not doing the loop or magic circle and you want to do the chain can you tell me how to start it? Hi Jackie, The pattern does not use the sl st to join and ch method for the end of rows; instead you are working in continuous rounds. This means when you reach the end of your round you will immediately begin the next round in the first (1st) stitch of the next round. Without any additional joining stitches or slip stitches. It removes the seam line up the back of the hat and gives the hat an overall clean and neat finish. You will need a stitch marker (safety pin or even a piece of yarn) to mark the first st of the round so you know when you get back to the beginning. The 1st st means the first st – I never realized it would be confusing – but I see why it could be now! because of the st st bit. I will make sure I write out ‘first’ from now on!! Thank you for mentioning this!! Your first stitch will always be your first stitch for every round of this pattern. When I crochet I always mark the first stitch with my stitch marker so I know where I need to start on the next round. this means you will work 2 hdc in the first st, in the next stitch you will work 1 hdc. You will repeat this (2 hdc in the next st, 1 hdc in the next st) 8 times around the hat and you will have 24 stitches at the end of this round. You will have added 8 more stitches this round and now have 24 stitches in total. So for this hat we need 54 sts at 3 sts per inch to fit a 3-5 year old’s head (normally 20″ circumference head) and since we need to make the hat fit it needs to actually be smaller than the head – so we are making the hat 18″ in circumference (it stretches 2 inches). 54 divided by 3 sts per inch is 18 inches. That is the maths behind it 😉 anyway the reason I wanted to show you R7 is because I only ask you to repeat the instructions in the first parenthesis 6 times. (2 hdc in 1st st, 1 hdc in next 5 sts) and then work 1 hdc in each of the remaining 12 sts to the end. This round increases only 6 stitches to make 54 in total. Also if you are newer to crochet you may wish to substitute the final slip stitch round for a single crochet round – the sl sts need to be worked loosely so they do not make the hat too snug – so I recommend omitting the final round completely, or working sc instead if you are newer at reaching a looser tension. I am new to crocheting and have made four hats, but they all used the slip stitch and chain. I am not clear on the the meaning of 2 hdc in 1st st, I get the 2 half double crochets in 1st stitch, but not the second abbreviation of stitch. I am also not beginning and ending in the same stitches. Please tell me what I am doing wrong. I don’t see a recommendation for the amount of yarn to purchase. I am planning to make the adult large. Thank you for the lovely pattern with the great sizes. My daughters head has a circumference of 26″. she has really thick hair. anyway I was wondering if you could suggest how I would increase this pattern to fit her head. Hi Rhondda! Love this pattern! What are the colors of the Bernat delux yarn that you used in the photo for this tutorial? I love all of them! The front one looks like seaspray but not sure of the other 2. Such beautiful colors. Thanks! Great pattern. Thank you! Love no seams! Hi Cheri 🙂 You are very welcome! I like working in spirals for hats when they are sc or hdc – for dc hats I find I need the extra chain stitches to bring the height of the current round up to the height of the next round – there is just too much of a difference in row heights and if you continue in a spiral I find it gives a bit of a hole in the hat where the rows meet. My basic rule of thumb – when designing or crocheting hats for myself 😉 – is spirals for sc and hdc stitches (or stitches of similar heights) and for any taller stitches working in rounds with a sl st to join and chain stitches to build up the height of the round. Another reason I tend to pick the dreaded sl st join and working in rounds over the spirals (which is my favourite) is when there is a colour change – it is the simplest way to make sure the colour sections line up to the same height. You can make it work with spirals – but it takes a little extra work to get it right. It is really a personal preference I think – and a mindset – I find older patterns follow the rule of rounds more often than more recently written patterns – even for amigurumi like toys. Some patterns I have come across from the 70’s and 80’s even have toys worked in rounds – whereas now it is almost unheard of to see an amigurumi in anything other than spirals and sc stitches. Hi Rhondda. First I would like to thank you for this pattern. I am expecting a new grandchild in November and decided I must find a hat pattern I can work with. The best part for me is that this is in the spiral with no joining, therefore no seams!! I crochet in the flat and some rounds very well but still have difficulties with joining properly and having it look as neat as I would like. Is there any reason this same pattern (no joins or seams) couldn’t be converted to use with another stitch – sc, dc, v-stitch, etc?? I have perused and attempted many patterns and still don’t fully understand why some work in the round must be joined and with some it isn’t necessary. Thanks so much for taking the time to read this as well as write out these lovely patterns to share. Rhondda, I am so impressed with the way you have presented your pattern. The very clear instructions, and informative information on the yarn differences, and ad free pattern was a joy to see. The ads and additional sites that followed were easier to see. Your pattern and all the sizes it included were wonderful. I loved that you shared it for free, on an old lady’s ( haha) budget it helps. I will be crocheting a number of your hats. Thank you so much for your skills. Your wonderful personality really comes through on This site. If you are using a US hook it is the I-9. I have no clue what crochet hooks are in mm? What is the letter for the 5.50 mm hook used in your half double crochet hat. I’m making a few for my son-in-law who was just diagnosed with terminal lung & lymph node cancer. Love this pattern and the look …I’m unsure as to how you start out? It starts out with row 1…8 hdc in adjustable loop..how many chains to get the loop? I’m used to starting out with chaing 4 or 5 and joining with a slip stitch. How does the pattern start? Yarn descriptions can be very difficult to grasp. The wraps per inch information isn't included on yarn labels (unfortunately!) – but you can check it yourself quite easily. I must admit sometimes I even bring a pencil with me to the yarn store with a one inch section marked off on it (I just create two black marker lines to show a one inch measurement) – then I take the yarn end from the ball on the shelf and wrap it around the pencil to see how many times it wraps around to get my wraps per inch. There are some great videos and instructions on how to find the information. If you are interested just let me know and I will respond with the links. For the purchasing of yarn quantities – there are some mathematical equations you can use to determine what you will likely need – but I don't do this – I usually check the recommended amount listed by the Designer (so for the ball of yarn they recommend I check the length included in that ball on the label – usually online) then when I substitute I get the same amount based on the length of the substituted yarn, plus one extra ball (just in case – in the same dye lot) and when I complete the project I return the extra ball if I didn't need it. Hope this helps a bit!! How generous of you to load this very comprehensive pattern. Thank you! Thank you for the wpi info. I've been crocheting for about two years and feel like I have a good grasp on following patterns and learning new stitches, but I am still easily confused with yarn descriptions. I've never notice the wpi info, now I will know to check the labels. One thing that continually gets me is quantity of yarn for a larger project. Many patterns call for "balls" of yarn, but each brand comes in many different lengths. Do you have a quick solution to this little problem? btw – love your patterns!